eBay Stock Looks Undervalued: Time to Buy? eBay may not be the most exciting growth company in the tech industry, but the stock is attractively valued at current prices. eBay (NASDAQ:EBAY) is not the most exciting company in the tech industry. While the business is still performing soundly, companies such as Amazon (NASDAQ:AMZN) and PayPal (NASDAQ:PYPL) are growing at a much faster rate and attracting more attention from growth-hungry investors. However, the best investments are not necessarily the most popular companies around, and eBay stock looks attractively valued at current prices. eBay comes well behind Amazon in e-commerce, both in terms of size and growth. eBay produced $8.5 billion in total revenue during the full year 2015, and constant currency sales are growing at nearly 5% year over year. This means eBay is just 8% the size of Amazon, since the online retail juggernaut produced a massive $107 billion in sales last year. Adding insult to injury, Amazon announced an explosive increase in constant-currency sales of 26% during the fourth quarter of 2015. Amazon is well-known for its relentless competitive drive; the company is all about growing sales and gaining market share versus the competition, even if this growth comes at the expense of razor-thin profit margins due to aggressively low prices for its products and big investments for growth. Investors who want a disruptive growth play in e-commerce typically go for Amazon as the obvious choice, so maybe eBay isn't getting the attention it deserves. Also, the separation between eBay and PayPal (NASDAQ:PYPL) is still fairly recent, as the two companies started trading separately in July of 2015. PayPal is growing its currency-neutral revenues at an impressive rate of 21% year over year, and many growth-oriented investors who held positions in eBay before the separation were eager to invest in PayPal without the e-commerce business being a drag on overall performance. In fact, this was one of the main reasons eBay and PayPal were separated. According to different academic studies, spinoffs tend to be fertile ground for investors hunting for undervalued opportunities, and this could easily turn out to be the case after eBay and PayPal separated their businesses last year. eBay stock is currently trading at a forward price-to-earnings ratio around 11 times earnings forecasts for the coming year. This is a huge discount versus both Amazon and PayPal, which are trading at forward price-to-earnings ratios of 67 and 20 times forecasted earnings, respectively. Since Amazon and PayPal are growing at faster rates than eBay, it makes sense to expect higher valuations for these companies. However, eBay is even trading at discount versus the typical company in the market. Based on data from Morningstar, the average company in the S&P 500 index carries a forward price to earnings ratio in the neighborhood of 17. It's not easy to understand why eBay should trade at a considerable discount versus the average company in the market. eBay is the second biggest player in a much-promising industry such as e-commerce, and this should provide plenty of opportunities for growth in the years ahead. Online commerce has been gaining ground versus brick-and-mortar retail over the last several years, but it still accounts for a modest 7.5% of all retail transactions in the U.S., so e-commerce has abundant room expansion in the coming years. 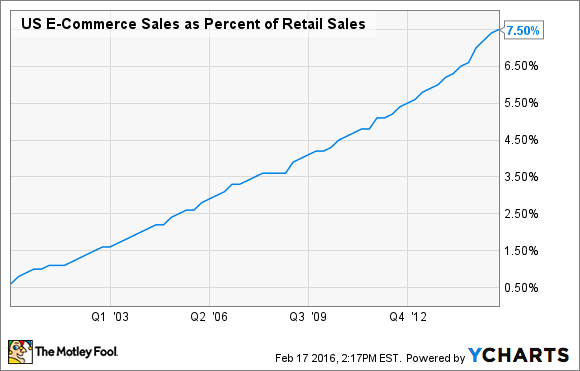 U.S. E-Commerce Sales as Percent of Retail Sales data by YCharts. eBay is not growing as rapidly as Amazon, but the key metrics are still moving in the right direction. The company ended the fourth quarter of 2015 with 162 million active buyers on its platform, an increase of 5% versus the the same quarter in 2014. Management is expecting constant-currency sales to grow between 3% and 5% in 2016, and while this is not particularly impressive, the company is already priced for modest growth expectations. eBay is a commerce facilitator as opposed to an online retailer, which means the company makes a commission for every transaction on its platform, and it doesn't face inventory risk. This reduces the uncertainty for investors, and it allows eBay to produce rock-solid profit margins in the neighborhood of 30% of revenue at the operating level. If you're looking for explosive companies with spectacular revenue growth, eBay is probably not the best choice for your portfolio. However, considering that the company operates in a promising industry and it has a remarkably profitable business model, eBay stock looks like a smart purchase at these prices.